In 1945, A&P supermarkets began holding “Chicken of Tomorrow” contests to encourage farmers to select for more productive and tender meat chickens. (At the time, most broilers were tough spent egg layers.) By the mid-50’s chicken had become tender enough to be served as the centrepiece for Sunday dinners. By the mid-70’s chicken had become affordable for mid-week dinners. And by the 2000’s chicken was cheap enough to be a ubiquitous fast-food ingredient. The dramatic decline in cost of production is primarily due to earlier maturity. 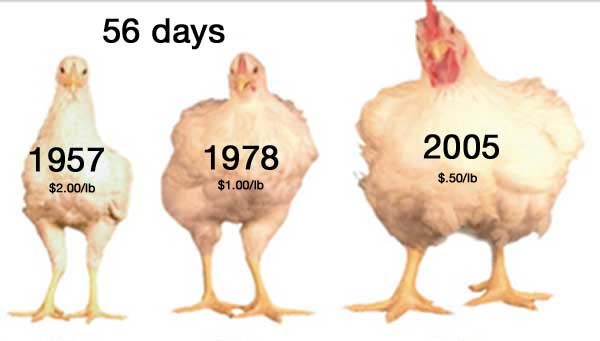 In the 50’s chickens were typically slaughtered at about 105-days. Currently they are large enough for slaughter at only 45-days. They are tenderer than ever; but the sacrifice has been a decline in flavour. Farmers are still quite capable to lead the way in improving the foods we eat by using the centuries-old methods of selective breeding. Recent outcomes of selectively breeding chickens. Toronto’s Big Carrot Natural Food Market is following in the footsteps of A&P with an annual grant program to expand the availability of locally produced organic food. 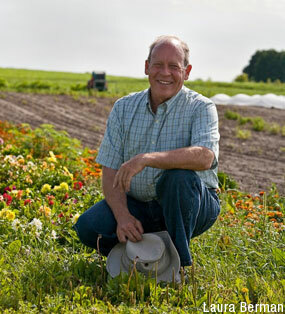 Their Nature’s Finest Fund provides financial grants for farmers to build capacity. If you are (or wish to be) a Big Carrot Supplier, start thinking about some capital investments you would like to make next year. Applications are due by December 18th. Please contact me if you would like help with preparing your application. Carrot Cache Foundation is supporting Ontario’s leading farmer-to-farmer knowledge-sharing organization by offering two $500-awards. They are looking for innovative low cost solutions to planting, harvesting, and managing food difficulties. Winners will be selected by the attendees at the first annual Ecological Farmers of Ontario Conference on December 4-6, 2014. This overnight conference in the comfortable facilities of Geneva Park will provide terrific farmer-to-farmer networking possibilities. There will be a wide assortment of workshops led by internationally recognized experts targeted for all types of working ecological farmers. I will be leading a workshop on quickly increasing profits by knowing the Costs of Production for each of your products. Despite what Bill Gates and Monsanto may say, nearly 70% of the world’s food continues to come from small farms. This is reliably accomplished despite decidedly unfair competition. The world’s large agribusinesses are currently receiving more than 70% of government supports. It would be both fair and wise for the world’s small farms to also benefit from agricultural policies that provide appropriate research, education, transportation, processing, irrigation and drainage, insurance and access to finance options. Yes, it will be more complicated for governments to serve several million farmers than a few hundred corporations. But this is totally possible. It would certainly cost a lot less money and could be accomplished in much less time with much less disruption of communities and the environment. There are a few glimmers of light that deserve recognition. The Canadian Federal government has contributed $300,000 for building and equipping the Colborn small-scale food processing facility. This will become a terrific boost for the many nearby small-scale farmers in Northumberland, Prince Edward, Peterborough and Kawartha Lakes counties. Small-scale farmers in other regions should encourage their local politicians to engage their local CFDC’s to also build and equip a local processing facility. Though not likely intended to support small farms, the Ontario government just became the first North American jurisdiction to ban the prophylactic use of Neonicotinoids! Though this will not take place until 2017, the prospect of again having sufficient pollinators will certainly aid small farms. It will also reduce the arsenal of cheap pesticides that benefit large agribusiness farms to the detriment of the environment and small ecological farms. Plus it is becoming more and more evident that Glyphosate (Roundup) will be the next cheap pesticide to be banned in North America (as it already is in most of the world). These two steps will do a great deal to level the playing field for farmers who are working to supply the ecologically benign foods that the world’s consumers are clamouring for. Frequently, the most expensive and most frustrating aspect of farm operations is Labour. Special attention needs to be paid to improving this. The off-season is a good time to consider ways to support a more productive staff. Most businesses realize their people are such a valuable resource that specialists are hired to nurture employees. Human Resource (HR) management is concerned with strategically administering employee recruitment, salary and benefits, education, evaluation, and (only as necessary) dismissal. The focus is to lower employee turnover in order to retain talent and knowledge. Hiring and training someone new is not only expensive, it also incurs risk that the replacement will be less capable. Unfortunately, most farms are so small and operate with such small margins that hiring even a part-time specialist is out of the question. But there is a wonderful non-profit web-based resource readily available for farmers. The Canadian Agricultural Human Resource Council (CAHRC) has a wide assortment of guides, templates, and skills development links specially prepared for farmers and farm-workers. Please explore this resource. Too many new farmers think they are saving money by engaging volunteers who are usually too transient to really be worth all the time to manage their training, bed and board. Minimally paid Interns are not only technically illegal; they soon walk away with all the valuable training you so generously gave them. These “cheap” options really cost more than one might think. I have found that it normally takes a full year of experience before an employee truly begins to contribute more value than they require of your time and money. So take the time to select capable, dedicated and fairly paid employees that you are confident will remain with you for many years. Too many experienced farmers have not prepared a Succession Plan. If there is a child who wants to continue operating the farm, the arrangement can be worked out if the process starts early enough. With no family connection, it is going to be very difficult to sell a farm business. Without a personal connection to the home and a love of the business, the high cost of land and the low margins of food invariably make the purchase of an operating farm a poor business proposition. On the other hand, transferring your farm business to a devoted employee can be a practical option. So take good care of your employees. They are not working long hours in the hot sun and cold winds to make a good income. They presumably love the natural magic of creating food from seeds, soil, water and sun. Learn and then provide what brings them satisfaction; and avoid what irritates them. Treat your employees as the valuable resource they are! You are receiving this because you expressed an intrest in sustainable good foods either via our website or your previous intrest in David Cohlmeyer's work.